Starting today, when you search the PSU Library catalog, you’ll be asked to log in to continue. 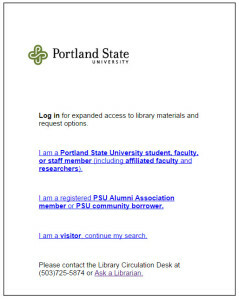 When you search the PSU Library catalog, you will be asked to log in. Current PSU students, faculty, and staff can use their Odin to log in. This will provide you with additional results and connect you more quickly to content owned by PSU Library. Registered PSU alumni and community borrowers will log in with their library barcode and password. People without a formal PSU affiliation can continue as a Visitor. If you have any questions about this, please ask a librarian for help.